The year 2012 ended in the best possible way for Cerri, with the sale to a Russian owner of hull number 3 in the 102 Flyingsport line. The Cerri 102 hull number 3 Flyingsport represents a true revolution in the open yacht sector for the shipyard, where innovation and modernity have always been core values and guiding principles. While this yacht's outer lines are the same of her sister’s, the concept of this new version is extremely innovative and takes to extremes the "FlyingSport" philosophy thanks to the owner's true ingenuity and its flawless interpretation by the creativity of the Cerri team. The FlyingSport line introduced the concept of a fly bridge in open crafts as back as in 2004 with 86 model sold so far in over ten units. This latest Cerri 102 now embodies the ultimate evolution of such a philosophy, no longer featuring two pilot stations, but only one on the fly bridge and replacing the second, on the main deck, with an innovative owner area that continues below deck with a really impressive private wellness area. From the highly panoramic cabin with glass sunroof, an internal staircase leads to the spacious wellness area, conceived as an "open air" circular "glass tube": a magnificent relaxation area with Turkish bath with chromotherapy and a sauna. Adjacent to the spa is the children’s room with changing top and a bed for a staff members, which thus completes the master suite. The under deck night area, aft of the spa, has also been thoroughly rearranged: it now features two more VIP cabins with double bed and private head, which can be accessed via the staircase from the main deck salon. This night area is characterised by very spacious volumes and large windows offering a beautiful panoramic view. 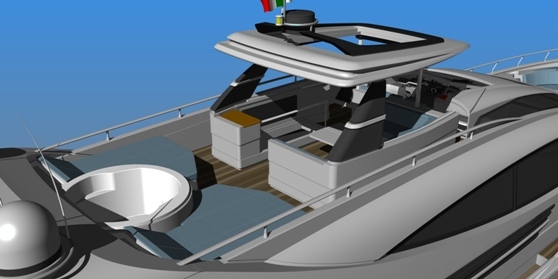 The pilot station and the dining room are located on the fly bridge and are sheltered by a hard top especially designed to allow closing the sides and including an electronically operated sunroof. A Jacuzzi, located aft of the dining area, adds the final touch to the main deck. Besides her innovative fly bridge, this yacht can also boast two pleasant outdoor areas: the aft cockpit on the main deck includes a comfortable sunbathing area and a dinette, while at the bow the wide lounge area with circular sofas is ideal to relax and chat while enjoying the utmost privacy. Two crew cabins with separate access and a galley fitted with all necessary equipment make up the service areas, while 2 MTU 2600 HP engines and the ZF Searex surface drives push the yacht to a cruising speed of approximately 30 knots with peaks of 38.